Glip, a messaging tool that was launched in 2014, has today released a big update to its service that overhauls the interface and improves the service’s first-party productivity tools. The company’s overhaul comes at a time when other messaging companies like Slack are really starting to gain steam. 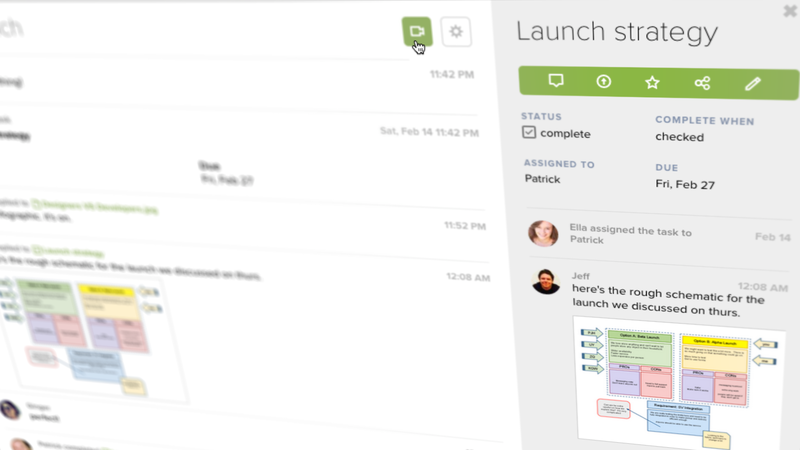 While similar to products like Slack or Flowdock, Glip puts its own spin on workplace chat. Glip 2, which is launching today, brings a faster and easier to use interface to the company’s product, along with improved tools for productivity so it has some distinct advantages over its competitors. Unlike tools like Slack that have lots of integrations but tend to keep them at arm’s length, Glip offers a bunch of fundamental productivity tools teams use every day, baked right in. 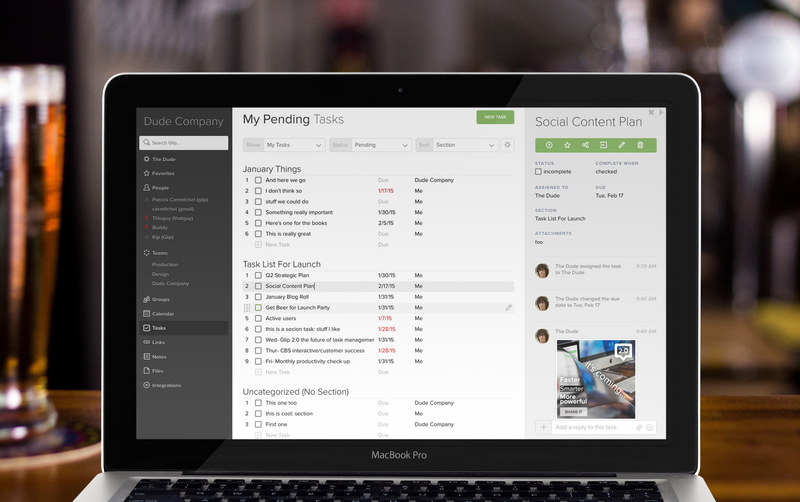 Glip includes a deep task management interface — similar to that of Asana — inside its service so you can directly create tasks inside the chat flow without ever dropping out to a secondary tool. Users can create calendar appointments right inside the chat flow, along with notes and a number of other first-party tools. A “shelf” next to the main chat stream tracks items shared in the room, along with referenced documents and tasks so users can always have a sense of context. When users upload files or photos, these appear here too. The tool’s unique position with these first-party tools becomes clear when working together on files inside Glip. Photos can be annotated directly by teams, sparking a threaded chat right on top of what’s being discussed. An associated task can then be created directly. Glip also includes instant video calling for entire chat rooms; all it takes is the press of a button and you’re on a high-quality video call. Although Glip has an office in Florida, the company is remote-first. Founder and CEO Peter Pezaris sees as an advantage, since it has to use the tool and learn first-hand what pains its customers might have. Glip’s productivity features are powerful, but could be a non-starter for some companies who already rely on certain productivity and communication apps. Glip solves this by integrating with other tools like Asana and Hangouts so customers don’t have to migrate from their preferred products. With its unique combination of first-party tools and work chat integration, Glip wants to be the center of the business productivity suite. It’s still early days for the tool, but today’s update makes it a compelling option for companies that want to drop email as much as possible.